Rory Zambard—who started CrossFit at 14—took 14th place at the 2013 Reebok CrossFit Games. Now, at 24, she’s stepped away from competitive CrossFit, and it wasn’t easy for her to leave behind something that had defined her. “I had found my identity in CrossFit for too long, and when I could no longer be who I thought I needed to be, or who people thought I needed to be in the world of fitness, things sort of fell apart,” Zambard said. When a CrossFit Games athlete makes the decision to step away from the sport, it’s not an easy transition. Competing at the highest level of any sport is all consuming, and giving it up leaves a vacuum many struggle to fill. 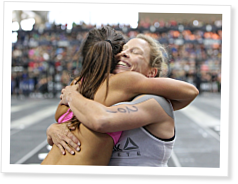 However, these athletes often find a pot of gold on the other side of hours of training and time away from family and friends: a return to basics and a renewal of what they initially loved about CrossFit and fitness.